With this day of penance and fasting — Ash Wednesday — we begin a new journey toward the Easter of Resurrection: the journey of Lent. I would like to pause briefly to reflect on the liturgical sign of ashes, a material sign, an element of nature, which becomes a sacred symbol in the liturgy, a very important symbol on this day in which we start our Lenten journey. Historically, in the Jewish culture, the practice of sprinkling ashes upon one’s head as a sign of penance was common and was often combined with the wearing of sackcloth or rags. For us Christians, however, this is the only time that we use ashes but it has a special ritual and spiritual relevance. First of all, ashes are one of those material signs that bring the cosmos into the liturgy. 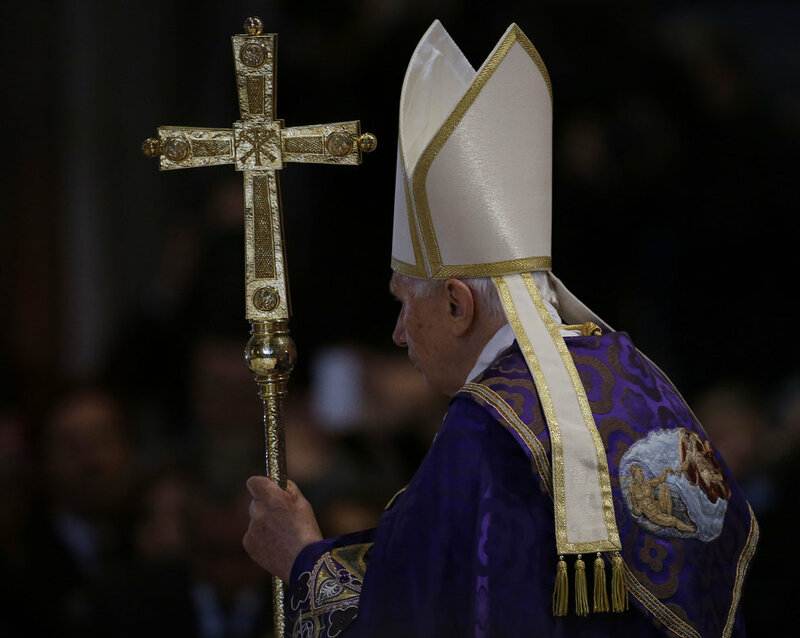 The principal signs are of course those of the sacraments: water, oil, bread and wine, which become true and proper sacramental material through which the grace of Christ reaches us. But in the case of ashes there is a non-sacramental sign that is, nonetheless, always connected to the prayer and sanctification of the Christian people: a particular blessing of the ashes — which we will perform shortly — is, in fact, specified before they are applied to the person’s forehead. There are two possible formulas for this blessing. In the first the ashes are defined as an “austere symbol”; in the second a blessing is requested directly upon them and reference is made to the text of the Book of Genesis, which may also accompany the imposition of the ashes: “Remember that you are dust and that to dust you shall return” (cf. Genesis 3:19). Let us pause a moment over this passage of Genesis. It concludes the judgment pronounced by God after original sin: God curses the serpent, who made the man and woman fall into sin; then he punishes the woman, announcing to her the pains of birth and an unbalanced relationship with her husband; finally he punishes the man, he tells him of the toil of labor and curses the soil. “May the soil be cursed because of you” (Genesis 3:17), because of your sin. So, the man and the woman are not directly cursed as, however, the serpent is. Still because of Adam’s sin the soil is cursed, the soil from which Adam was formed. Let us re-read the magnificent account of the creation of man from the earth: “Then the Lord God made the man from the dust of the soil and breathed into his nostrils a breath of life and man became a living being. Then the Lord God planted a garden in Eden in the east and there put the man he had made” (Genesis 2:7-8); thus the words of the Book of Genesis. This is why the sign of ashes brings us back to the vast canvas depicting creation, in which it is said that the human being is a singular unity of matter and divine breath, as suggested by the image of the dust formed by God and the divine breath breathed into the nostrils of the new creature. We can see how in the account of Genesis the symbol of dust undergoes a negative transformation because of sin. While before the fall the soil is a potentiality that is completely good, fed by a spring of water (Genesis 2:6) and able, by God’s handiwork, to bring forth “every sort of tree, fair to behold and pleasant to eat of” (Genesis 2:9), after the fall and the consequent divine malediction, it produces “thorns and thistles” and only through “toil” and “sweat of the brow” gives up its fruits to man (cf. Genesis 3:17-18). The dust of the earth no longer reminds us only of God’s creative gesture, wholly open to life, but becomes a sign of an inescapable destiny of death: “You are dust and to dust you shall return” (Genesis 3:19). It is evident in the biblical text that the earth participates in man’s fate. Speaking of this in one of his homilies, St. John Chrysostom says: “See how after his disobedience everything is imposed upon [man] in a way contrary to his previous manner of life” (Homilies on Genesis 17, 9: PG 53, 146). This cursing of the soil has a medicinal purpose for man, who must from the earth’s “resistance” be helped to keep himself within his limits and recognize his nature (cf. ibid.). Another ancient commentary expresses itself in this way in a beautiful summary: “Adam was made pure by God for his service. All of the creatures were given to him to serve him. But when evil reached him and conversed with him, he heard it by his external sense. Then it penetrated into his heart and took over his whole being. When he was thus captured, the creation that had helped and served him, was captured with him” (Pseudo-Macarius, Homilies 11, 5: PG 34, 547). We said a little bit ago, quoting St. John Chrysostom, that the cursing of the soil has a “medicinal” purpose. That means that God’s intention, which is always beneficent, is deeper than malediction. The latter, in fact, is not due to God but to sin, but God cannot fail to do it because he respects man’s freedom and its consequences, even the negative ones. Therefore, in the punishment, and also in the malediction of the soil, there remains a good intention that comes from God. When he says to man, “You are dust and to dust you shall return!” together with the just punishment he also intends to announce a path of salvation, which will travel through the earth, through that “dust,” that “flesh” that will be assumed by the Word. It is in accord with this salvific perspective that the verse of Genesis is taken up by the Ash Wednesday liturgy: as an invitation to penance, to humility and to an awareness of our mortal condition, but not to end up in desperation, but rather to welcome, precisely in this mortality of ours, God’s unthinkable nearness, which, beyond death, opens the passage to the resurrection, to paradise finally rediscovered. In this sense we are given orientation by a text of Origen, who says: “That which was at first flesh, of the earth, a man of dust (cf. 1 Corinthians 15:47), and which was dissolved through death and again made dust and ashes — in fact it is written ‘You are dust and to dust you shall return’ — was raised up once more from the earth. Afterward, by the merits of the soul that inhabits the body, the person advances toward the glory of a spiritual body” (On the Principles, 3, 6, 5: Sch, 268, 248). The “merits of the soul,” of which Origen speaks, are necessary; but Christ’s merits are fundamental, the efficaciousness of his Paschal Mystery. St. Paul offered us a summary formulation in the second Letter to the Corinthians, today’s second reading: “He who did not know sin God made sin for our benefit, that in him we might become the justice of God” (2 Corinthians 5:21). The possibility for us of divine pardon depends essentially on the fact that God himself, in the person of his Son, wanted to share our condition, but not the corruption of sin. And the Father raised him with the power of his Holy Spirit; and Jesus, the new Adam, became, as St. Paul says, “life-giving spirit” (1 Corinthians 15:45), the first fruits of the new creation. The same Spirit that raised Jesus from the dead can transform our hearts from hearts of stone to hearts of flesh (cf. Ezekiel 36:26). We invoked him a moment ago with the Psalm “Miserere”: “Create in me, O God, a pure heart, / renew in me a firm spirit. / Do not banish me from your presence / and do not deprive me of your holy spirit” (Psalm 50:12-13). That God who banished our first parents from Eden, sent his Son to our earth devastated by sin, he did not spare him, that we, prodigal sons, might return, contrite and redeemed by his mercy, to our true homeland. May it be so for each one of us, for all believers, for every man who humbly recognizes his need of salvation. Amen. 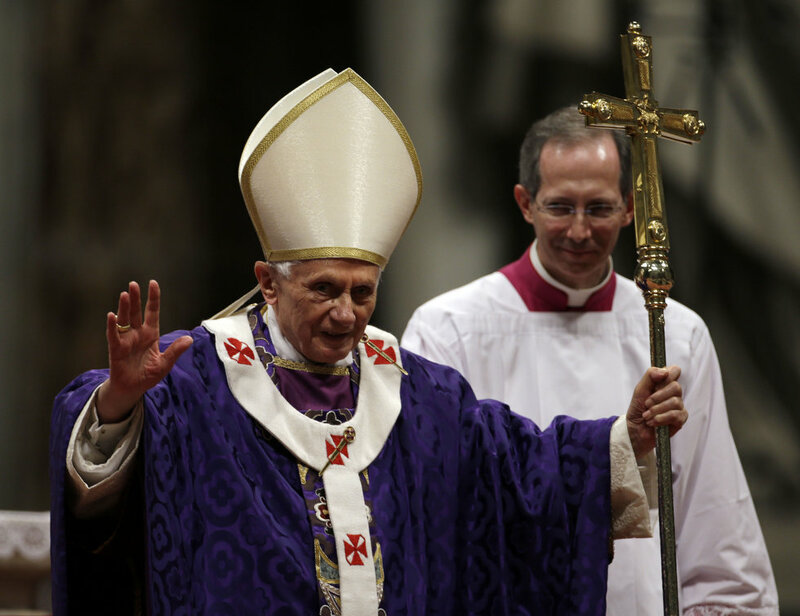 This entry was posted in Lent, Pope Benedict and tagged Ash Wednesday, General Audience, Pope Benedict XVI by texasnuns. Bookmark the permalink.